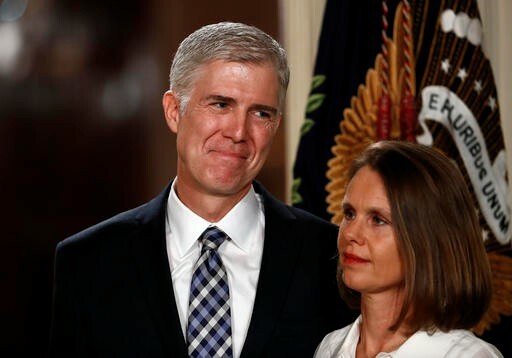 WASHINGTON (AP) — President Donald Trump nominated Neil Gorsuch, a fast-rising conservative judge with a writer’s flair, to the Supreme Court on Tuesday, a selection expected to spark a fierce fight with Democrats over a jurist who could shape America’s legal landscape for decades to come. At 49, Gorsuch is the youngest Supreme Court nominee in a quarter century. He’s distinguished himself on the Denver-based 10th Circuit Court of Appeals with his clear, colloquial writing, advocacy for court review of government regulations, defense of religious freedom and skepticism toward law enforcement. “Judge Gorsuch has outstanding legal skills, a brilliant mind, tremendous discipline and has earned bipartisan support,” Trump said, announcing the nomination in his first televised address from the White House. Gorsuch’s nomination was cheered by conservatives wary of Trump’s own fluid ideology. If confirmed by the Senate, he will fill the seat left vacant by the death last year of Antonin Scalia, long the right’s most powerful voice on the high court. President Barack Obama nominated U.S. Circuit Court Judge Merrick Garland for the vacancy after Scalia’s death, but Senate Republicans refused to consider the pick, saying the seat should be filled only after the November election. 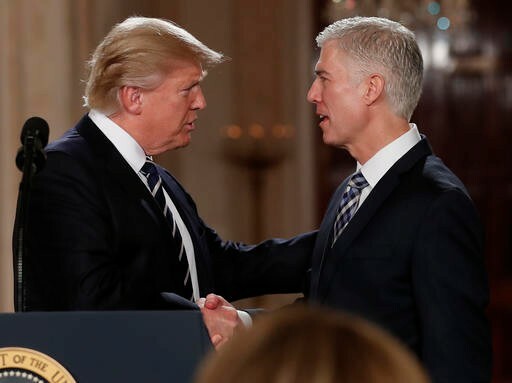 Trump’s choice of Gorsuch marks perhaps the most significant decision of his young presidency, one with ramifications that could last long after he leaves office. After an uneven start to his presidency, including the chaotic rollout of a controversial refugee ban, Trump’s selection of Gorsuch appeared to proceed with little drama. For some Republicans, the prospect of filling one or more Supreme Court seats over the next four years has helped ease their concerns about Trump’s experience and temperament. Three justices are in their late 70s and early 80s, and a retirement would offer Trump the opportunity to cement conservative dominance of the court for many years. Gorsuch was among the 21 possible choices for the court Trump released during the campaign. Other finalists also came from that list, including Thomas Hardiman, who serves alongside Trump’s sister on the Philadelphia-based 3rd U.S. Circuit Court of Appeals, and William Pryor, a federal appeals court judge and Alabama’s attorney general from 1997 to 2004. Pryor’s standing slipped in the lead up to the announcement, in part because his reputation as a staunch conservative seems likely to make him a rich target for Democratic senators in a confirmation hearing. “Now is not the time for business as usual,” MoveOn.org’s Ilya Sheyman said in a statement. Gorsuch is a Colorado native who earned his bachelor’s degree from Columbia University in three years, then a law degree from Harvard. He clerked for Supreme Court Justices Byron White, a fellow Coloradan, and Anthony Kennedy before earning a philosophy degree at Oxford University and working for a prominent Washington, D.C., law firm. He served for two years in President George W. Bush’s Department of Justice before the president nominated him to the appeals court. Gorsuch has contended that courts give too much deference to government agencies’ interpretations of statutes, a deference that stems from a Supreme Court ruling in a 1984 case. He sided with two groups that successfully challenged the Obama administration’s requirements that employers provide health insurance that includes contraception. Story by Julie Pace and Mark Sherman of the Associated Press. 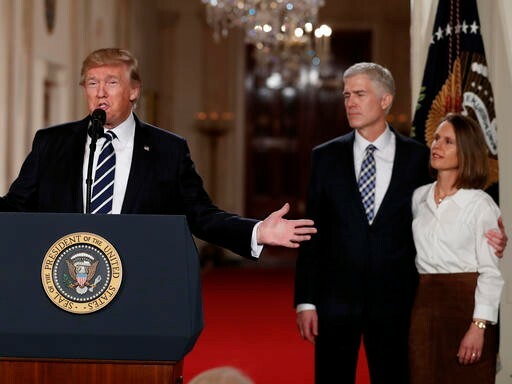 AP Writer Julie Pace has a misleading statement in her report: “Trump has encouraged McConnell to change the rules of the Senate and make it impossible to filibuster a Supreme Court nominee — a change known in the Senate as the “nuclear option.” This statement insinuates that this is the first time that the “nuclear option” is being considered, which is not true. “Three years after using the “nuclear option” to upend Senate tradition by effectively removing filibusters against most presidential nominations, Senate Democrats insisted Thursday they don’t regret that decision, even as Donald Trump becomes president and they recognize they may be powerless to block controversial nominations…. While it is true that 60-vote filibusters are apparently still available for Supreme Court nominations, it was disingenuous for Pace to omit the fact that the “nuclear option” was initially implemented by Senate Majority Leader Harry Reid during the Obama presidency.